But is your device compatible? Netflix subscribers around the world can now tune into the company's highest quality Super HD streams, providing they have a device and internet connection willing to play nice. The Super HD streams, which arrive at a higher bitrate than the existing Full HD 1080 streams, promise improved picture quality as the movie or TV show is subject to less compression. The streaming giant has been testing the improved video quality with selected ISPs this year, but has now opened Super HD up to all members, regardless of their provider. In a post on the company blog, Netflix explains: "Netflix uses 'adaptive streaming' to dynamically adjust the video quality based on the available bandwidth. This means that the ability to receive Super HD depends on broadband quality and performance." There are, as always in these situations, a couple of provisos. Subscribers must have enough bandwidth (upwards of 5Mbps or 7Mbps for best quality), while not all content is optimised. Plus, not all HD devices support the tech. Currently, the most recent Apple TV set-top box, the PS3, Nintendo Wii U, some Roku devices and the Netflix Windows 8 app will allow it. 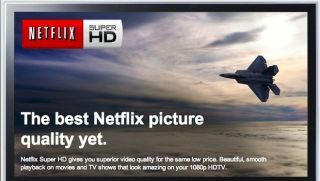 There's also "Blu-Ray Players, Smart TV's, Home Theaters, and Streaming Players with existing Netflix 1080p support," Netflix says, with more to follow. In addition, Netflix says it is continuing to work with ISPs as part of its Open Connect initiative, which allows ISPs to cache content from the service and deliver it to users more efficiently. Netflix adds the personal touch with individual profiles for users on the same account.